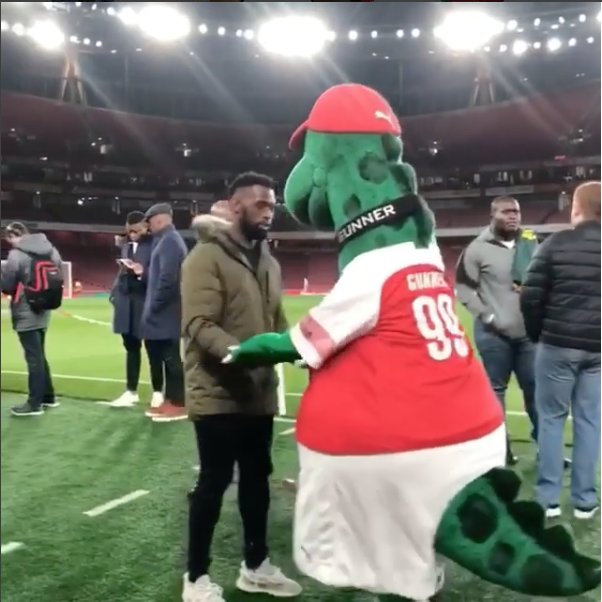 Arsenal’s mascot Gunnersaurus gave the Springboks some tips at Emirates Stadium on Wednesday night. Arsenal bounced back from their draw with Crystal Palace by beating League One side Blackpool 2-1 at the Emirates Stadium to reach the EFL Cup quarter-finals, as both teams had a player sent off. Unai Emery’s side saw their 11-match winning run come to an end at Selhurst Park on Sunday, but they avoided falling short for a second game in a row, even if the performance left a lot to be desired. An otherwise unremarkable first half was punctuated by Stephan Lichtsteiner’s first goal for the club and 18-year-old Emile Smith Rowe seemingly wrapped things up in the 50th minute. But Matteo Guendouzi’s red card just before the hour for two cheap bookings boosted the visitors and they pulled one back through Paudie O’Connor soon afterwards.